Salted or Unsalted, Quarter Cubes, 16 oz. #5174, Add this coupon to your shopping list, print and present coupon to cashier for savings. $5.00 minimum purchase excluding coupon items. Additional $2.99. Limit one coupon per family. #7351, Add this coupon to your shopping list, print and present coupon to cashier for savings. $5.00 minimum purchase excluding coupon items. Additional 2/$7. Limit one coupon per family. #5175, Add this coupon to your shopping list, print and present coupon to cashier for savings. $5.00 minimum purchase excluding coupon items. Additional $2.99. Limit one coupon per family. #5183, Add this coupon to your shopping list, print and present coupon to cashier for savings. $5.00 minimum purchase excluding coupon items. Additional $3.99. Limit one coupon per family. $ 1 48 lb./first 7 lbs. #5184, Add this coupon to your shopping list, print and present coupon to cashier for savings. $5.00 minimum purchase excluding coupon items. Additional at $1.78 lb. Limit one coupon per family. 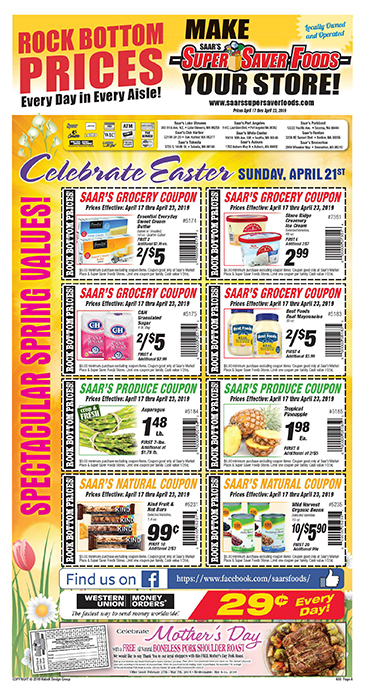 #5185, Add this coupon to your shopping list, print and present coupon to cashier for savings. $5.00 minimum purchase excluding coupon items. Additional at 2/$5. Limit one coupon per family. #5231, Add this coupon to your shopping list, print and present coupon to cashier for savings. $5.00 minimum purchase excluding coupon items. Additional 2/$3. Limit one coupon per family. #5235, Add this coupon to your shopping list, print and present coupon to cashier for savings. $5.00 minimum purchase excluding coupon items. Additional 99¢. Limit one coupon per family. The fastest way to send money worldwide. Pick up your Holiday Roast Punchcard at Saar's next time you shop. Then, show your punchcard when you check out. The checker will punch your card according to the amount of your purchase.